(Brussels, November 4, 2016) – Uzbek authorities should immediately and unconditionally release imprisoned political activist Samandar Kukanov, whose sentence has been arbitrarily extended for three years by Uzbek prison authorities, the Association for Human Rights in Central Asia (AHRCA), Ezgulik Human Rights Society, Freedom House, Human Rights Watch, and the International Partnership for Human Rights (IPHR) said today. Kukanov is one of the world’s longest held political prisoners. On October 30, 2016, it became public that prison authorities had arbitrarily extended Kukanov’s term, allegedly for “violating prison rules,” beyond his scheduled October 6 release date. The EU and the UN Committee against Torture have repeatedly called for Kukanov’s release, and the Uzbek government’s persistent refusal to free him is an example of its blatant disregard for its international human rights obligations, the groups said. Mirziyoyev became interim president in September, following the death of Karimov after 27 years in power. Kukanov, 72, was the vice chairman of Uzbekistan’s parliament following independence, and a successful businessman. He also sat on the executive committee of the peaceful opposition Erk (Freedom) party. 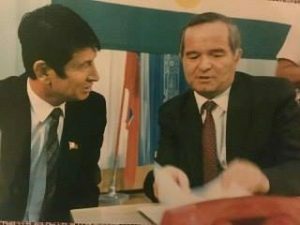 In June 1992, Kukanov took to the floor of parliament to protest Karimov’s announcement of plans to consolidate all security service divisions under his direct command. Kukanov was joined by other members of parliament, including Shovruh Ruzimuradov, a rights activist repeatedly persecuted throughout the 1990s by the Uzbek security services (known by their Russian acronym, SNB). Ruzimuradov died as a result of torture in July 2001, a month after he was arrested. Security forces arrested Kukanov in June 1992 on charges of economic crimes linked to his alleged financing of Erk. SNB officers held him incommunicado without access to counsel for an entire year in the basement of an SNB facility in Tashkent, during which time they tortured him, before finally bringing him to trial. Kukanov’s relatives told Human Rights Watch that SNB officers arbitrarily detained two of his sons immediately following his arrest and conducted a number of nighttime raids on his home to instill fear in his family. In 1993, he was sentenced to 20 years in prison. Kukanov is in Zarafshan prison 64/46 in Navoi. His family has been denied the right to visit him for much of the past 24 years. Kukanov’s family had expected his release in May 2013, but then learned that authorities had arbitrarily extended his sentence through October 2016. His sentence will now be extended through 2019. If Kukanov completes his current term and is released, he will have been in prison for 27 years, the longest known case of politically motivated imprisonment in Uzbekistan. His sentence would also exceed the 25-year maximum prison sentence length available under Uzbekistan’s criminal law (Article 50 of Uzbekistan’s Criminal Code). Human Rights Watch has documented Uzbek officials’ practice of arbitrarily extending the sentences of people imprisoned on political charges. The action is often taken just days before the person is to be released, on bogus grounds such as possessing “unauthorized” nail clippers, saying prayers, or wearing a white shirt, and may result in years of additional imprisonment. The eight-year sentence of another imprisoned rights defender, Ganihon Mamatkhanov, was due to end on June 4. But days before Mamatkhanov’s release, officials accused him of unspecified “violations of prison rules” and extended his sentence by three years. On October 25, prison authorities released a human rights defender, Bobomurod Razzakov, on medical grounds one year prior to the end of a four-year sentence. But evidence has emerged that Razzakov was seriously ill treated and denied appropriate medical care in prison. For Constitution Day on December 8, Uzbek authorities regularly announce early prisoner releases, potentially for thousands of prisoners, nominally entitled “amnesties.” Such early releases generally apply to those convicted of less serious offenses and for specific categories such as teenagers, women, and prisoners over 60. But those imprisoned on politically motivated charges are almost never released. Political prisoners who would otherwise be eligible for release are denied year after year for alleged infractions of internal prison regulations. The Uzbek government should release everyone imprisoned on politically motivated charges, the groups said. They include the human rights activists Azam Farmonov, Mehriniso Hamdamova, Zulhumor Hamdamova, Isroiljon Kholdorov, Gaybullo Jalilov, Nuriddin Jumaniyazov, Matluba Kamilova, Ganikhon Mamatkhanov, Chuyan Mamatkulov, Zafarjon Rahimov, Yuldash Rasulov, Bobomurod Razzokov, Fahriddin Tillaev, and Akzam Turgunov; journalists Solijon Abdurakhmanov, Muhammad Bekjanov, Gayrat Mikhliboev, Yusuf Ruzimuradov, and Dilmurod Saidov; opposition activists Samandar Kukanov, Kudratbek Rasulov, and Rustam Usmanov; and religious figures and other perceived government critics Aramais Avakyan, Ruhiddin Fahriddinov, Nodirbek Yusupov, Dilorom Abdukodirova, Botirbek Eshkuziev, Bahrom Ibragimov, Davron Kabilov, Erkin Musaev, Davron Tojiev, and Ravshanbek Vafoev. The European Union is scheduled to hold a human rights dialogue with Uzbekistan on November 8, and should urge President Mirziyoyev to uphold Uzbekistan’s international human rights commitments and release all those held on politically motivated charges, the groups said. The EU-Uzbekistan human rights dialogue will have extremely limited utility without clear benchmarks for Uzbekistan’s progress and consistent pressure from the highest levels of European governments, the groups said. In Tashkent, for Ezgulik human rights organization, Vasila Inoyatova (Russian, Uzbek): +99-893-562-4780 (mobile). In Brussels, for the International Partnership for Human Rights, Brigitte Dufour (English, Russian, French): brigitte.dufour@iphronline.org.